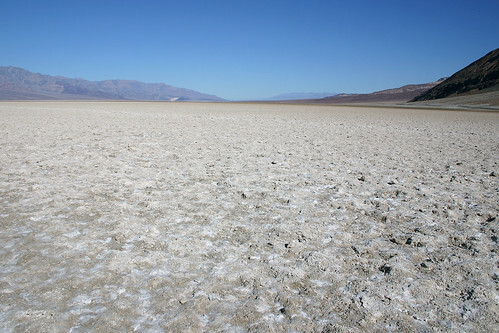 Taken at Badwater Basin. And by low point I mean 282 feet below sea level. This is the lowest point in the United States (and the Western Hemisphere). Amazingly, just 85 miles away is Mount Whitney, which at an elevation of 14,505 feet is the highest point in the lower 48 states. I hiked out a little way on the salt flat. Even at around 9:30 in the morning in late autumn, it was blazing hot. I quickly made my way back to the shade. This entry was posted on March 12, 2008 at 9:03 pm and filed under Bad Water Basin, California, Death Valley, Death Valley National Park, desert, National Park, vacation.